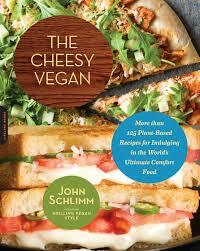 The Cheesy Vegan by John Schlimm. Publisher: Da Capo (2013). Cooking/ Vegetarian & Vegan. Paperback Original. 244 pages. ISBN 978-0-345-7382-1679-9. 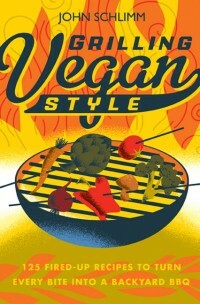 John Schlimm embraces the comfortable with this cookbook as well as his others: Grilling Vegan Style and The Tipsy Vegan. If you’ve become a vegan for health reasons, Schlimm’s got your covered. Drink, grill and now make your own cheese or indulge in all kinds of cheesy recipes with the assistance of this new cookbook. Making vegan food too similar to meat remains a pet peeve for me. I gave up meat for many reasons. I don’t need any reminders. But I don’t want to get personal. Also I’m not going to discuss the cruelties involved in the dairy industry. You can do your own research. Chapters include: The DIY Vegan Cheese Kitchen; Breakfast & Brunch; Soups & Salads; Sides; Sandwiches; Appetizers & Snacks; Suppers; Mac ‘n’ Cheese; Cheesecake; Vegan Cheese Pairings: Wine, Beer & Cocktails. In the first chapter—DIY Vegan Cheese Kitchen—Schlimm tells readers how to make different kinds of cheese such as nooch cheese. Cheese made with nutritional yeast, one of a vegan’s favorite ingredients. I already make this all the time and like it. I use it as an occasional pasta sauce and for mac and cheez and greens. To make cheddar, brie, swiss and mozzarella he uses either cashews or pine nuts. I just don’t have the equipment or kitchen space to be doing this. If I really feel I need some fake cheese, I’d just buy some soy or rice cheese slice from Whole Foods or the health food store. Sclimm has a feta recipe that requires tofu, miso paste, rice wine vinegar and nutritional yeast which I ‘m most likely to try at some point. I’ve made a faux ricotta cheese for vegan lasagna from tofu. The rest of the cookbook consists of recipes—125– using the cheese he made in the first chapter or substituting store-bought faux cheese. Honestly I’m not all that impressed. But newer vegans or those who really really miss cheese will adore this cookbook. In the United States, cheese gets added to everything. Sometimes too often.